What are the anti-cancer properties of broccoli? To preserve the anti-cancer properties of broccoli, it is best to cook them briefly on steam. Among functional foods, broccoli play a special role – further research confirms their anti-cancer properties, more and more often they are mentioned in the prevention of atherosclerosis and cardiovascular diseases. Jeffery, American specialist in functional foods. What ingredients of broccoli are particularly valuable? One of the key components of broccoli are glucosinolates, which occur mainly in plants from the Brassica family – among othersbroccoli, cauliflower, brussels sprouts or cabbage. They enter into a reaction with a special enzyme, myrosinase, so that the active agent, sulforaphane, is released. He is responsible for the health properties of broccoli – reduces the likelihood of cancer, cardiovascular disease or atherosclerosis. Do the latest studies confirm the anti-cancer properties of broccoli? Sulforaphane – an active ingredient in broccoli – helps prevent inflammation in the cell. It stimulates the production of enzymes that destroy foreign harmful chemicals.Speaking of a cell, I mean in the first place cells of the intestinal walls through which food is absorbed. Liver, kidneys and heart are also kept in good condition. 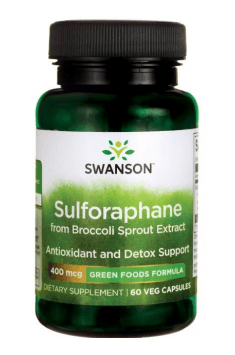 We have also recently known about the positive effects of sulforaphane on the brain. In the context of cancers, broccoli is primarily preventive and does not substitute for medication in the disease. During the fight with cancer, the patient takes many medications and their concentration in the body is very high. to good form, because individual organs are weakened by subsequent inflammation, and broccoli prevents these conditions. There has been a lot of research on the anti-cancer effects of broccoli, for example, the probability of prostate cancer is reduced by up to 40% when a man broccoli 3 to 5 times a week, and broccoli is similarly prevented. Does eating broccoli play a role in the prevention of other diseases? Because broccoli is much more effective in preventing cancer than many other vegetables, research on broccoli was initially mainly carried out in the context of cancer prevention. But there are more and more studies related to other diseases – eg regarding the positive effect of broccoli on the cardiovascular system. We owe this effect to the fact that broccoli strengthens the body’s overall immunity. In what form is it best to eat broccoli to make full use of their properties? The sulforaphane contained in broccoli will not work if we lose the enzyme contained in the broccoli. This enzyme dies when exposed broccoli to a very high temperature, e.g. in a microwave oven or during cooking. The solution is to make steamed broccoli for max.3-4 minutes. In this case, the enzyme will not be lost, and broccoli will retain its beneficial health properties. In the case of loss of enzyme, a trick can help us. Under certain circumstances, even broccoli prepared in a microwave oven or boiled can regain its properties, so that it should be served with a raw cabbage vegetable to provide the broccoli with a lost enzyme, studies have shown that in this case the active agent is also released in broccoli, and thus we take full advantage of the beneficial properties of this vegetable.